The swirl of darkness – as that of a moonless night; no twinkling sparkle of even the slightest of stars pops through the heavy blanket of gloom. It envelopes. It digs. Mangled talons drive into depths deeper than that of an abyss. The emptiness providing a haven for iniquities that run deep as they do wide. A fight. A struggle. Sweat drips hard and fast against this swirling monstrosity. It breaks and it gnaws. For every momentary victory comes an even more deciding defeat. Every wound that begins to heal eventually finds itself torn again. A swirling mass of destruction. It does not cease, it does not rest. It hurts, it cripples. It weakens and destroys. Crushing. Suffocating. With great torment, delaying the inevitable…death. For isn’t written as such – every sin done, is another death earned? But then, the echoing sound of a single drop falling. Its descent being felt through empty chasm. A single drop that darkness cannot touch. A drop that, with rushing force, brings forth the light. It is the only way to victory against this raging war. The drop, is the blood of innocence and perfection being given up to an entity that requires a punishment of death. It is the drop of blood spilt in an ultimate act of sacrifice. It is the drop of blood that was beaten, crushed and squeezed out as the heaviness of iniquity was heaped upon perfect innocence. This drop? It is the blood of Jesus. A blackened, beaten and charred soul. It is not worth to even be spat upon, and yet, it finds itself being made new in the washing of precious blood spilt. It is redemption meeting realization of being made new. The blackness, momentarily appeased, comes back with the taste of blood fresh on gnashing teeth; Its mouth watering at a soul washed and clean. It raises talons, a swift and deadly strike inevitable. Stunned. A force field wrapped around vulnerable soul is the same blood spilt. The blood that satisfied the debt to darkness was not bound to its despairing hold. For in the innocent blood’s death, a Victor emerged. Darkness lacks a hold on victorious blood, its harrowing reign is over. Blocked is every strike given. Retreat is inevitable for the entity of darkness whenever it rears itself for attack, for every time and with every strike, there will be victory in Jesus. In Jesus. Through Jesus. Only Jesus. Left on our own, we might delay a battle, but we will surely lose the war. Our soul, new and restored, is only an ever increasing temptation to darkness. The desire to see ruin, to see brokenness and to see death is its sole desire. With every sun rising and with with every sun setting, there must be surrender of – will, desire, anguish, hurt…of all that is imperfect and broken…of all that is mind, soul, body and strength. In the surrender comes a Warrior and Rescuer to carry us through in return. He brings wholeness, He brings redemption, He brings strength, He brings victory, and my friends, He brings grace. Grace that abounds where sin runs deep. Grace that is so scandalously undeserved, yet so perfectly needed. Yes, not just some of our sins…but all of our sins. It rests on our willingness to accept a gift that is so graciously free. We watch. We feel. Those we love are around us, darkness looming and raising itself victorious over them. And we know. We, who have been there. We, who have coward under darkness’ crushing blow and who have experienced agnozing despair. We who have felt the hot breath of death and then felt the sweet rescue of the God who saves, the Savior – Jesus Christ. We who know that love’s rescue is not found in the doing of things, it is only found in the matchless blood of Jesus. How do we, sinners set free, extend that same hope to our friends, family and strangers that are lost with darkness’ grip set deep and sure in their hearts. We pray, we plead and we love. But we are not enough. The lifeline, the sure rescue…how do we share with someone who wants it and craves it, but does not understand the daily surrenderance of iniquities that haunt deep? Or, how do we share with the one who is running hard and fast from the only One who can set them free? Hearts beat. Hearts cry. Hearts long to see the captives set free. Our worries? Our hurts? Our pain caused by loved ones bound captive? There is peace, perfect peace. This is the promise I cling to when in dead center of my own battles or when in the midst of joining with others in their’s. With knees bent, head bowed and spirit lifted upward I will keep heart, soul and mind stayed on Him – the Giver, the Taker, the Sustainer, the Reedemer…the Lord Most High. 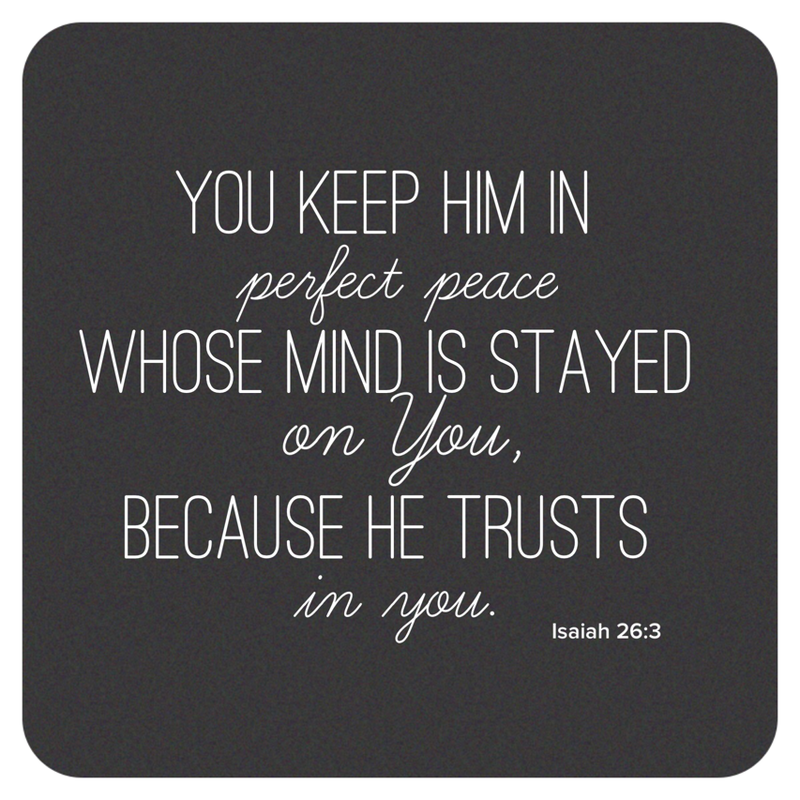 Then, and only then, I will rest in His perfect peace. A perfect peace, the kind that passes all understanding. A peace given by a God who is Sovereign. A peace that doesn’t promise for all to be okay, but promises to walk alongside through valley’s deep and dark. A peace that will trust and hope for the drawing near of hearts and the surrendering of souls. A peace that trusts in The One who softens the hardest of hearts. A peace that is everlasting to everlasting.